I intended on publishing this on Thursday or Friday, but a ton of other things got in the way, and then Tim and I have spent the last 24 hours driving many, many, many and then some miles to visit his grandparents, having realised we hadn’t done it in a while and it was an important thing to do. I’m all good with family outweighing this blog, just as I’m cool with this blog outweighing my need to sleep and generally function. Let’s go, on with the show. You know what I love? What really makes me want to hug myself but also not want to draw attention to it for fear of breaking the spell and then it’ll all be over? Spontaneous good times. I just wish I could schedule them into my life more often. Like, “You there! Closest friends of mine! Nothing’s happening this Saturday, so let’s all pretend like we’re going to do other things separately but actually we all secretly understand that we’ll meet at someone’s house at 9pm and then drink lots of whisky and stay up all night talking about our lives and feelings!” Obviously life doesn’t actually work like that, but I think if we all tried to maintain this pretense, it could be quite, quite rewarding. I say this because last Saturday, after a five-hour photoshoot for The Cookbook, we had a couple of people round for a game of Game of Thrones. (Yes, it’s a boardgame; no, it’s not just a group of us dressing up and talking all ye olde and calling everything we drink Summerwine or Good Brown Ale; yes I would probably be up for that too though; no there is no alternative to calling the board game ‘Game of Game of Thrones’.) That photoshoot was particularly exhausting – sounds ridiculous, but it takes it out of a person – we were all super low in energy when it was done, and I figured it was going to be a very quiet night. Smash cut to 11:00pm when I tweeted “Everyone in the world is at our house and no-one is allowed to leave until they’ve drank all our alcohol and eaten all our food” (because if I like you, that’s the kind of host I am.) There was a dance party in the kitchen. There was the Game of Thrones TV theme song sung while Brendan played it on the accordion (which is the most magnificent thing to hear – not us singing along with it so much, but the accordion itself – so imposing!). There was, well, pretty much everything the tweet implied. It was so fun, and I had no idea it was going to happen. So let’s all plan for more spontaneous times, okay everyone? It’s not pretty, it’s occasionally kinda ugly, but the design is compelling and fun and the writing is generally super brilliant. It’s expensive but it’s only out four times a year and it’ll probably take me a quarter of a year just to read this issue. And it has this cake from pastry chef/musician Brooks Headley. 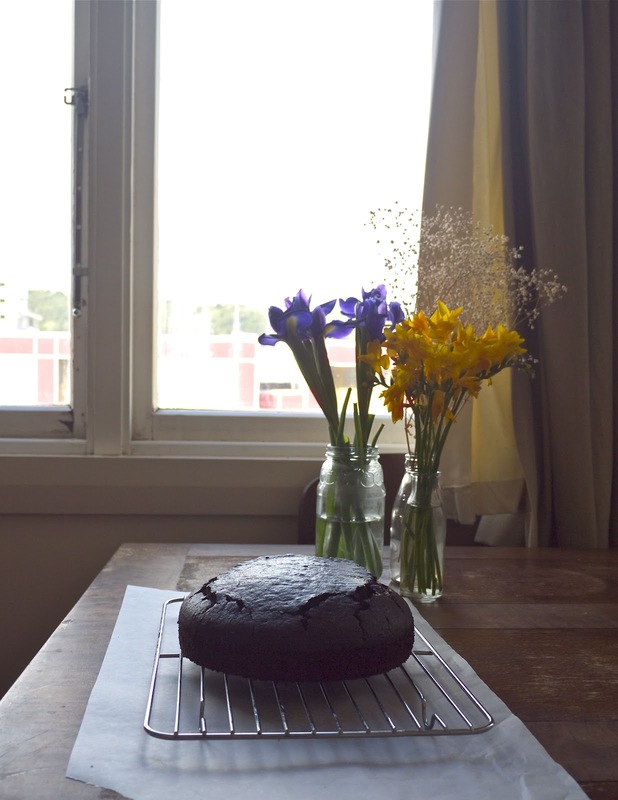 It appealed to me – a plain, but excellent-sounding chocolate cake is what everyone needs up their sleeve (figuratively) and in their mouths (literally). The recipe is all in cups, being American, and in the magazine it was three times bigger than this – all I needed was one cake so I scaled it back. Forty-five minutes later when I finally figured out the mathematics of it all, I can attest that it is a fantastic recipe. Life is strange. I buy really expensive cocoa which actually tastes like chocolate, and used that here, but I couldn’t bring myself to use a full 2/3 cup of also-pricey olive oil, so I went for 1/3 cup olive oil and 1/3 cup plain cooking oil. You do what you like. 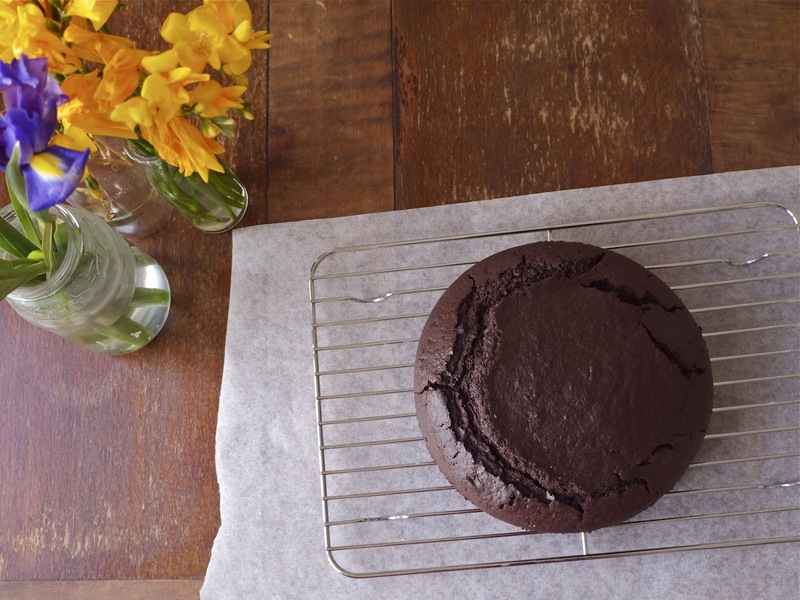 Set your oven to 170 C and line a 20 or 21cm cake tin with baking paper. The hardest thing you’ll have to do is heat the water and cocoa together. So to do that: in a decent-sized pot or pan, since you might as well mix everything else into it, stir the cocoa and the water together and heat gently – continuing to stir so it doesn’t burn – until it just starts to bubble. Remove from the heat and allow to cool down some – I filled the sink with an inch of cold water and whisked the cocoa and water to move this process along – then whisk in the remaining ingredients. Pour into your cake tin and bake for around 30 minutes. Brooks states that this recipe is “foolproof”. I am wary of this description. Getting your learner driver license is foolproof, they told me. Well this fool just failed, I replied, tearfully. It goes on. But this cake really is very straightforward. And importantly: delicious. 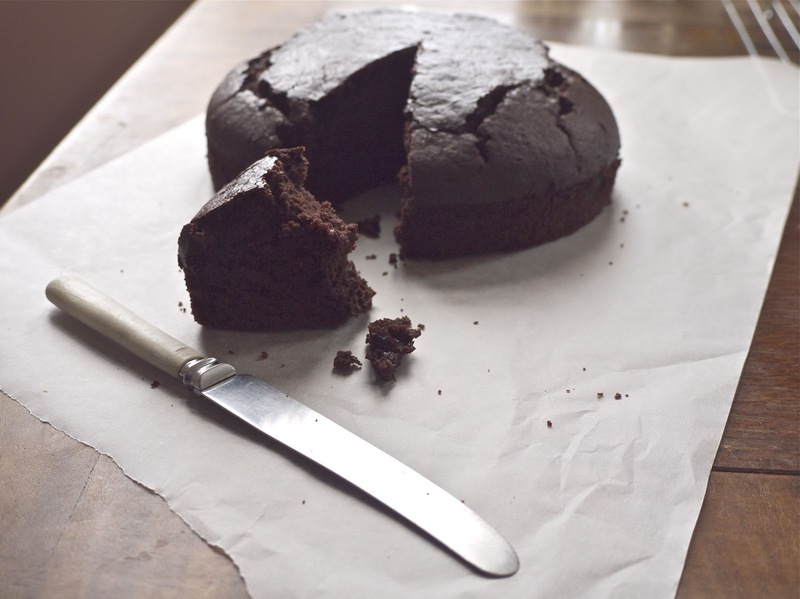 Don’t be scared of the olive oil, it has its own nutty, buttery flavours that are perfect for chocolate and it makes for a long-lasting cake with a light crumb. I made this to augment the contents of the ‘snack table’ during some photoshoots this week and the final slice, eaten for breakfast yesterday before driving up to Tim’s grandparents’ place, was every bit as good as the first. So thanks, Lucky Peach. Long may you be excellent. Title via: How Lucky Can You Get, the Kander and Ebb song from Funny Lady, the sequel to Funny Girl. I love Barbra, but Julia Murney interprets it deliciously. As she does with everything. Frank Ocean, Bad Religion. OBSESSED. It’s not music, but I have been watching this video lots and crying nearly every time, which is what I tend to do with music anyway. Nadia Comaneci in 1976, getting – spoiler alert – a perfect 10 for her floor routine. I used to be so (here comes that word again) obsessed with her as a kid, and youtube has helped me remember just why. Next time: Whatever it is, I’ll blog about it sooner this time, promise! don’t you wanna be the life of the party? don’t you wanna be the cream of the crop? That looks like an excellent recipe! I'm scared of Lucky Peach though – I can't deal with being less cool than the magazines I buy. I like the sound of spontaneously joyful evenings – there should definitely be more of those in everyone's lives. Love the look of this cake too – I think there should be more of this cake in my life. Bookmarked. 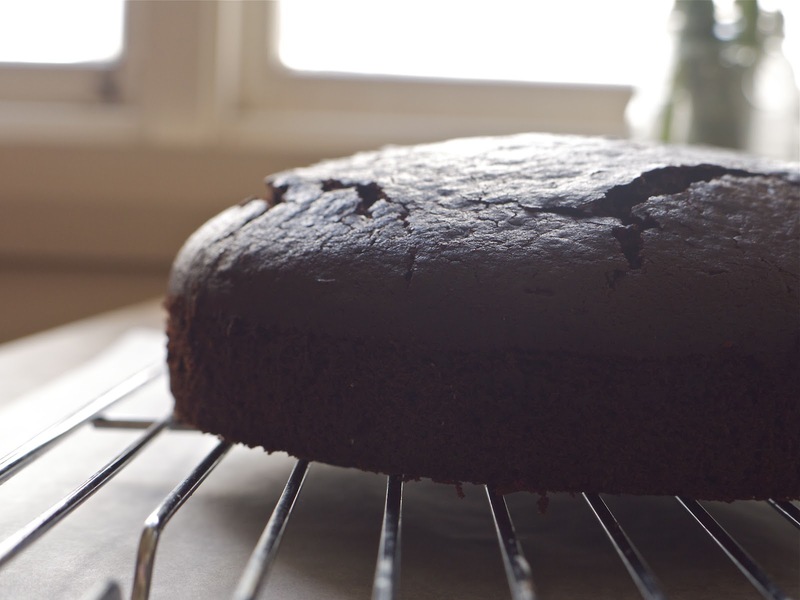 A chocolate cake which only requires a whisk and a pot is certainly my kind of cake. Yusss to Lucky Peach and spontanteous whiskey filled dance parties! I did a school project on Olga Korbut as a kid, because I pretentiously wanted to write about someone less “obvious” than Nadia. Man, I was ridiculous sometimes. TREME!! I've been meaning to talk to you about that for… a year? From the first episode I watched, Iw as thinking “I bet Laura knows of and loves this”. I don't think I ever messaged you about it though? Down in the Treme, just me and my baby…. Question: Can I commission you to make this cake for me for my friend's birthday party this weekend?!?! I fear in my clean-eating state that I will devour the entire bowl of raw cake mix before I could cook it. Would you? Would you?! I'll pay you! HOLY cow I used to be the mad Nadia fan as a kid and I definitely did a project on Olga as well. Wow, what a neurotic child. I'm still obsessed with gymnastics a million years later and have my own commentary going on as if I know what I'm talking about. Hah. y daughter has been making a very similar cake for years (since she was about 5) from a Mary Pat Fergus book? I've just made it – and it's in the oven now. It bears some ingredient-resemblance to the infamous microwave “salad dressing cake”. I didn't have yoghurt or buttermilk so used vinegar/milk mixture to recreate. (Love Google in emergencies like this.) Will let you know how it turns out. Jeez now you've got me digging deep into the annals of YouTube gymnastics history. I've made it through highlights reels and am now charting my way into documentary features. Gymnastics used to look so attainable, in a way. The way that they still looked mostly human. There's some wild stuff going on these days, coupled with gymnasts who look kind of like robots. I love it all. I love chocolate recipes that don't require chocolate chips (they never last long in my house)…might have to give this delicious looker a try! I LOVE spontaneous good times like that! I wish I could plan them at least once a week. But perhaps maybe then they wouldn't be quite as special? Hmm. Spontaneous good times must be fun. Ooo, the cake looks delicious. Just made this again – with buttermilk (never bought it or used it before). It took about 12 minutes longer to cook this time. For ease of cutting into pieces for lunch boxes, I made it in a square tin It doesn't seem to have been affected by that. 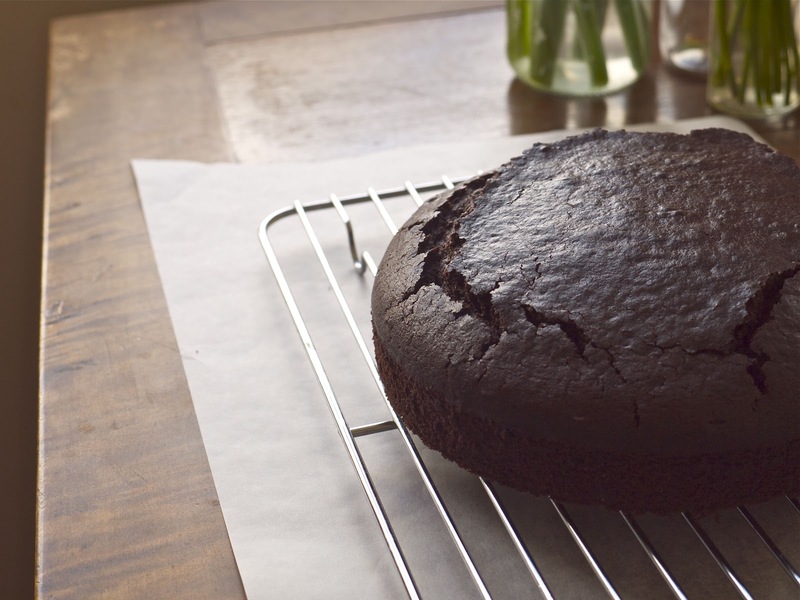 I think this has become my default chocolate cake! Arg guts me I don't live in Welly's anymore! I'd be so up for spontaneous times with whisky! I was ridiculous too – we once did a class project on 'Flight' and I didn't want to do anything obvious, so I went with flying fish and flying squirrel. Instead of like, a bird or a plane. And Treme is SOOOOO GOOD WATCH IT NOW!